with Salvatore Natoli, Bianca Tosatti, Roberta Serpolli, and Cristiana Campanini. On Monday January 23 at 4.30 p.m., the Anish Kapoor show in the Fabbrica del Vapore, Milan will be the venue for a conversation about Kapoor’s monumental work Dirty Corner. The guests will be the philosopher Salvatore Natoli; the “irregular” art historian Bianca Tosatti; the researcher Roberta Serpolli; and the art journalist Cristiana Campanini. The moderator will be Pietro Nocita, the show’s executive producer. This will be a unique occasion for hearing the views of various people about the genesis and symbolism of this site-specific work by the Anglo-Indian artist. For Anish Kapoor himself the heart of the work is the very act of its creation. The observations of Salvatore Natoli (for this occasion he defines himself, not as a philosopher, but as a simple visitor) will engage with the main themes to be found in Dirty Corner: the earth-symbolism; the synthesis of male and female; the idea of infinity. 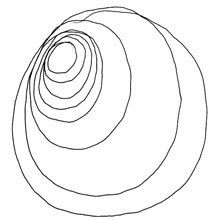 For Bianca Tosatti – who considers Anish Kapoor an artist accessible to all – this will be an occasion for exploring the darkest and most disturbing aspects of artistic creation; Roberta Serpolli will analyze the works of artists who have dealt with themes similar to those of Kapoor. Cristiana Campanini will summon up the comments of both the general public and the specialized critics who have visited the exhibition over the past months. Conferenza gratuita fino ad esaurimento posti. 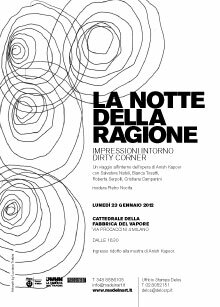 In occasione della conferenza, per tutto il giorno, la visita all’installazione Dirty Corner sara’ possibile ad ingresso ridotto di €4.